"In the year that King Uzziah died I saw the Lord sitting upon a throne, high and lifted up; and the train of his robe filled the temple. Above him stood the seraphim. Each had six wings: with two he covered his face, and with two he covered his feet, and with two he flew. And one called to another and said: Holy, holy, holy is the Lord of hosts;the whole earth is full of his glory! And the foundations of the thresholds shook at the voice of him who called, and the house was filled with smoke. And I said: Woe is me! For I am lost; for I am a man of unclean lips, and I dwell in the midst of a people of unclean lips; for my eyes have seen the King, the Lord of hosts!" Have you ever been caught in a thunder storm? Not your average, every day thunderstorm with a few rumbles, but I mean the big, terrifying, no-delay-between-flash-and-BOOM! variety? The put-your-hands-over-your-ears-and-cower variety. I have. On a mountain, in a tent, at night. Terrifying. That passage above is from Isaiah 6. It seems to me that the "Holy, holy, holy" would be a terrifying thing for humans and should not be read in a light-hearted or blase' or bored way. The seraphs that say it are fearsome creatures and their "Holy, holy, holy" should be thought of as the cower-in-your-tent-big-thunderclap-on-the-mountain-at-night-BOOM! Deafening to the human ear. 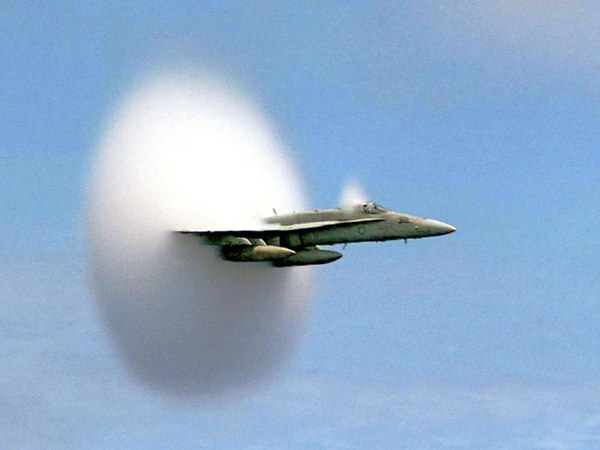 Like a sonic boom in terms of sheer volume. And to think: all of this is to put on display the greatness and awesomeness and fearsomeness and power and Holiness of the God who, for instance, could speak into the pre-creation nothing and, Wham! things begin to be! If this is even a little bit close to what it was like in Isaiah's vision, then his reaction of "woe is me, I am undone!" makes perfect sense...you and I would feel the same way. Yes-BOOM, yes-Boom, yes-Boom!... how much do we miss when we read the Bible apart from the context...the 'tone' of the passage. Not to belabor, but go back when you've a moment to Tozer's prayer at the beginning of ch3, The Knowledge of the Holy, ...Thy glory is ineffable! ..I was blessed this evening to think and feel like one who has met the Lord Christ as Isaiah did. Thanks for that Tim. I'll go back to ch 3. Funny you should mention it. I have just been about to make a post about the preface to Knowledge of the Holy. In it I'm going to say that it may be, at least to me, the best preface of any book I've read. How poignant a point he makes about the state of the church and how much more true (tragically) for the church today. And I must add: what a blessing those prayers at the beginning of each chapter are! What reverence.